Keeping in touch with everyone using some or the other ways to communicate. Online chatting using Facebook, Google talk, etc will make things easier. Also some use Skype for making internet calls for free. Why to connect Facebook account with Skype ? Doing so lets you IM and call your Facebook friends, read your News Feed and even post status updates — all from within the VoIP service. You may be somewhere else on earth and your friends may be somewhere else, but you can stay in contact with them with the use of free internet calls using Skype. You have the facility to do "unlimited calls" to landlines in more than 40 countries which includes mobiles too. With this there is a great advantage of "group video calls" which initializes communication with more than one at a time like in a conference and share some beautiful thoughts with it. You can also "share your screen" as to what you are seeing on net that will be shown to them too. 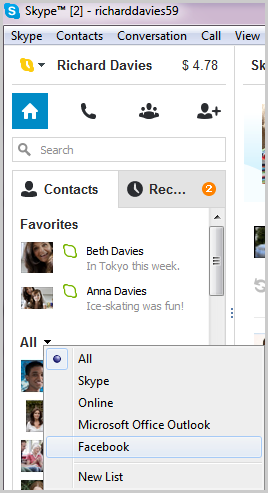 Now there is a special facility to combine the contacts of Skype and Facebook . You can connect your Facebook account with the Skype account id to have the more advantage of seeing the news feed from Facebook on the Skype platform. It’s easy to keep in touch with your Facebook friends with Skype. First, you need to connect your Skype account to Facebook, and then you can view the Facebook News Feed and contact your Facebook friends. Then select the "Contacts" tab and click on "All"
Very keen in engaging Facebook account everywhere !!! !